A good many years later, in 1962 to be exact, Belinda Mulrooney Carbonneau, during an interview she gave in her Seattle home, remembered her huge friend and companion with tears in her eyes, who had always stood beside her during the Klondike Gold Rush and later, her travels in Europe. She’d lean on Nero’s back along the muddy footpaths around Dawson and Nero offered her security while walking through the gold mines of the Bonanza Creek. The bar and restaurant of the Grand Forks Hotel would be a place of rest and recreation for the exhausted prospectors – and also offer them a way to spend their hard earned gold very fast. This hotel was the first and the most popular among the members of Belinda’s “hotel chain”. Week after week, kings’ ransoms would be deposited for short times in the not so large safe of the hotel. There was no bank in Dawson at the time. This was a major problem. Every week, of every ten days, the money had to be taken to Skagway. This work would normally be coordinated by Belinda Mulrooney herself. In the spring of 1898, Belinda, Nero and some miners started off on one of these trips with a considerable load of gold dust. Two sacks filled with gold dust were strapped on Nero’s back, one hanging on each side, too. The huge dog carried the heavy bags with ease, and not a man would dare touch him. Thaw came quick that year, which made the journey difficult. The creeks were flooded and the footpaths were slippery. A fallen tree served as a bridge across one of the swollen creeks. Belinda crossed first with her tightly packed knapsack, followed by Nero. Halfway through the “bridge”, the dog slipped and fell into the rapid, icy water. The sacks on his side pulled him down like anchors. Belinda immediately threw off her knapsack and jumped into the water, hanging on to a willow tree that extended over the creek. But this only resulted in her being dragged away by the creek, too. Gasping for air in the icy water, she somehow managed to grab Nero’s collar, but was unable to lift the dog out of the water. At one of the bends of the creek, the miners finally caught Belinda, who, herself half-drowned, was still clutching the seemingly lifeless dog’s collar. “Cut the gold off the dog!” – she tried to scream to her saviours. “Save the dog! Leave that wretched gold!” – and although her company was outraged at such a mindless though and the harsh swearing from a lady, they acted without delay. The gold was lost, but Nero’s life was saved. When her second and third hotel was built, Miss Mulrooney was already the richest woman in the Klondike region. At this time, she had already visited her family in Pennsylvania several times, often visiting Seattle and San Francisco as well. Nero would always accompany her, of course, and Belinda would never keep her money with her; it was in a purse tied to Nero’s collar. Seattle’s public safety records at the time could have used some improvement, yet Belinda never once complained about attempts to rob her. Upon returning to Klondike, Belinda acquainted Charles Eugene Carbonneau, who claimed to have French aristocratic ancestry, although his ill-wishers said he was simply a champagne salesman from Quebec. We have avoided mentioning it so far, but it must be admitted that Belinda’s beauty was nowhere in direct proportion to her wealth. This, however, did not deter the handsome Frenchman (on the contrary!) and asked for the lady’s hand. Surprising as it may be, Belinda made her answer dependent upon Nero’s reaction; should the dog growl at him, the wedding would be out of the question. Nero did not. On the contrary, quite against his nature, he enthusiastically licked the slightly scared groom’s hand. They went to Paris on honeymoon, and spent the entire year 1900 in Europe. Back in the New World, they settled in Seattle, where Nero continued to live until the end of his life. Not insignificant is the fact, that literature made Nero immortal. In 1897, a young Californian writer by the name of Jack London, ventured North to try his luck. He spent a winter in a log house with a bunch of prospectors, about 60 miles from Dawson. He found no gold, but took home a multitude of stories, which he eternalised in several forms over the next 19 years. His world famous novel, The Call of the Wild, was published in 1903. 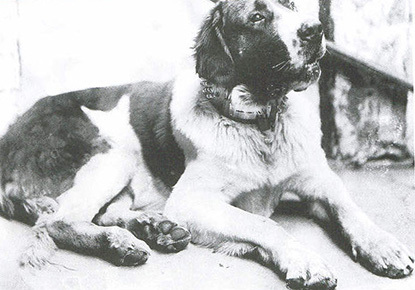 Its protagonist is Buck, a dog London modelled out of two real-life dogs: Belinda Mulrooney’s Nero, and Clarence Berry’s mastiff named Julian. Nero’s life, with minor changes, has been presented to the readers of the world in several millions of copies, translated to thirty languages.